On June 4, 1996 an unmanned Ariane 5 rocket launched by the European Space Agency exploded just forty seconds after its lift-off from Kourou, French Guiana. The rocket was on its first voyage, after a decade of development costing $7 billion. The destroyed rocket and its cargo were valued at $500 million. A board of inquiry investigated the causes of the explosion and in two weeks issued a report. It turned out that the cause of the failure was a software error in the inertial reference system. Specifically a 64 bit floating point number relating to the horizontal velocity of the rocket with respect to the platform was converted to a 16 bit signed integer. The number was larger than 32,768, the largest integer storeable in a 16 bit signed integer, and thus the conversion failed. 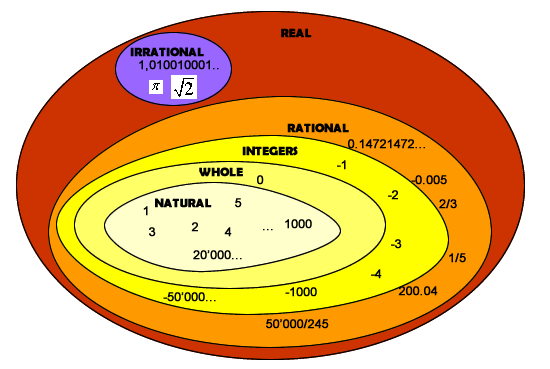 Rational numbers are those numbers formed as ratio of two integers. In our case, 2/3 is a decimal number with a "periodic sequence"; the integer 6 repeating forever.So they include also repeating decimals (0.666...) and terminating decimals (such as 0.4 i.d 2/5). But they can be, just numbers like 1,2,3,4...and 0 since the bottom integer can be 1 as well. In other words, we can say that all integers are also rational numbers. The "bottom" number of a rational number cannot be zero ! This is simply because you cannot divide a number by zero (try with the calculator; you will get an error message). To express the same idea, how can you separate 10 apples in groups of zero apples? It's a logical nonsense. The calculator will refuse to continue if you do divide any number by zero. Rational numbers form a system of numbers where division is always possible except for zero. There is a whole branch of mathematics called "Number Theory" which study the properties of numbers and their intrisic relations, especially of integers. More exactly "number theory is largely concerned with properties of the set of positive integers, and as such has a considerable overlap with algebra... One the of the foundation stones of number theory states that every positive integer can be written in exactly one way as a product of prime numbers" .This fundamental properties of positive numbers has been applied in computer cryptography to develop security codes. So, some mathematicians just do that, they "play" and look beyond number for more meanings and laws. Isn't is a more relaxed way of looking at mathematics? Free 24 hour pass to lynda.com. Stay in touch with nature. It's full of mathematics! This Website is Powered by Site Build It! - and I would never use anything else.